Here is best "Tuti Patriots vs Dindigul Dragons" ,14th Match DREAM11 Predictions for the Fantasy user ,who venue are looking to make a strong team for maximum win. We are providing latest news, match update, information about the match .The team is picked by using various factors on the basis of performance, ground stats and latest form.
'' Dindigul Dragons have so far played four matches, out of which three have won.They are first in the point table.Dragons would be eyeing their 4th consecutive win when they face Patriots." 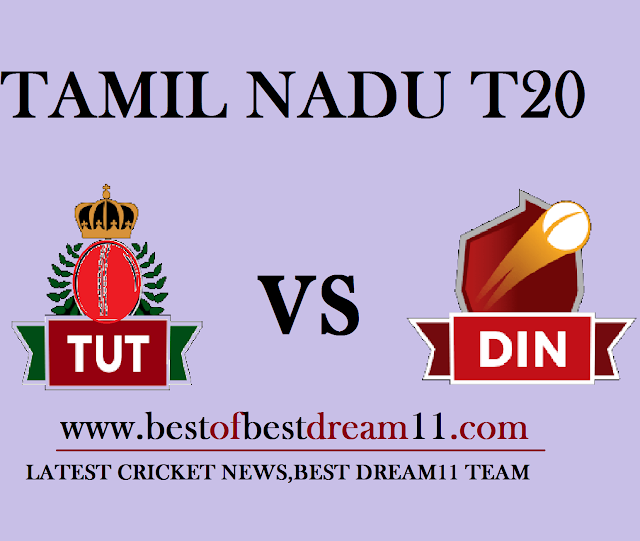 Tuti Patriots have played 3 matches,out of which two have won and one match loss.They lost their last game against Madurai Panthers by 7 wicket. Both teams would like to go ahead with the win, in such a way we can get a lot of exciting matches. 1-Kaushik Gandhi blasted 111*off 68 balls against Kanchi Veerans and he is leading run-getter for Tuti Patriots. 2-Subramanian Anand ,Akshay Srinivasan and Kaushik Gandhi are the batting pillars.The top four in a great touch with bats. 3- A Surma,Malolan Rangarajan,V Davidson are the crucial bowler for TUT. 4-For Dindigul Dragons,H Nishanth,N Jagdeesan,NS Chaturved are the key batsman. 5-N Jagdeesan is top scorer for Dragons(with 2 fifty).